Dell SAS Disk 05TFDD 2.5" SAS harde schijf kopen? | That's IT! Nieuw in blisterverpakking, een supersnelle, hoge capaciteit 2.5" SAS-disk voor een bodemprijs. The AL13SEB Enterprise Performance 10k HDD models combine the performance of 10,500rpm spindle speed with capacities up to 900 GB in a compact, power efficient 2.5-inch form factor. The AL13SEB Series is engineered for mission critical IT operations. The AL13SEBxxxN supports 6.0 Gbit/s SAS and provides 512 B per sector native format required for legacy applications and operating environments while delivering sustained transfer rates reaching 195 MiB/s. 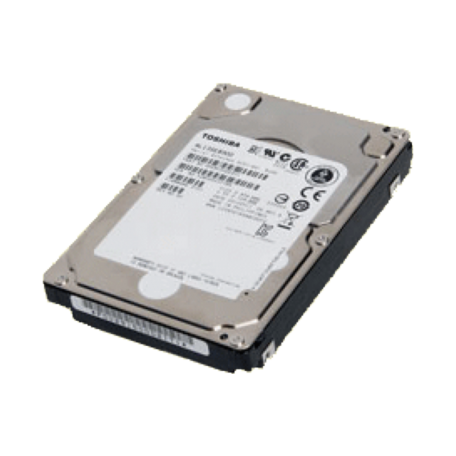 In addition, AL series helps to reduce operating costs by lower access time and power savings compared with Toshiba legacy 3.5-inch Enterprise Performance HDD models (MAW3xxxNx). ...maar ook voor elke andere server of workstation met ondersteuning voor 2.5" SAS-schijven!